Use code DT2K9JD3 to drop the price to $6.99! Great for a baby shower or new baby gift! 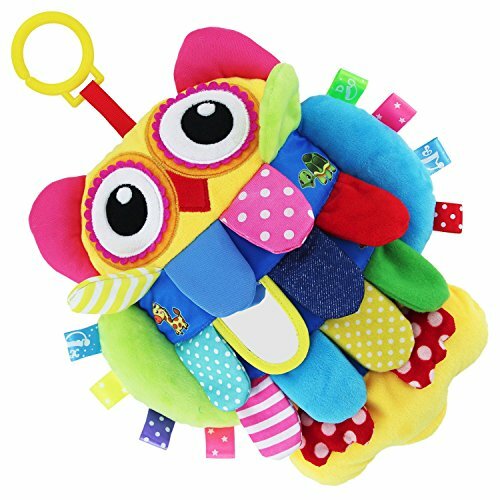 ♫ BABY'S FIRST ENTERTAINMENT AND CURIOSITY ENHANCER - Baby first toy teaches your little one how different things feel by touch with these soft owl, watch them get excited over touching different feel, and teaches them basic reading and comprehension, Crinkling, squeaking, multi-textured soft toy is perfect for baby. ♫ ELIMINATES THE NEED TO WORRY ABOUT YOUR CHILD WHILE "PLAYING" THEM - Because babies put everything into their mouth, the quality of this toy is extremely important. Our cloth toy is totally safe for your baby:non-toxic, strong stitching, washable.The stitching is strong for extra durability. The toy features a carrying handle on the side which makes it easy to attach to a stroller or playpen. ♫ CAPTURING YOUR CHILD'S ATTENTION JUST GOT A LOT EASIER - These baby toys has tons of super-fun characters, vibrant images with vivid patterns and colors,Peek under the feather to find hidden animal pictures, tail encourages grasp and finger strength, A shatterproof mirror can attract your baby's interest. Make your baby happy when traveling with baby owl toys! ♫ GIVE YOUR CHILD A FLYING START -Playing this soft toy gives you a chance to bond with your baby, a warm moment together.The Owl Infant Toy is the best toy for babies & infants, which is not just a colorful plush toy but it is also a baby growing buddy. it could double as a pillow while reading to a toddler! ♫ CUSTOMER SATISFACTION IS TOP PRIORITY -Any problem you encounter or any suggestion you get, please contact with our customer service; and our service team is always ready to offer help!100% Quality Warranty:You can get a full refund if you are not satisfied.